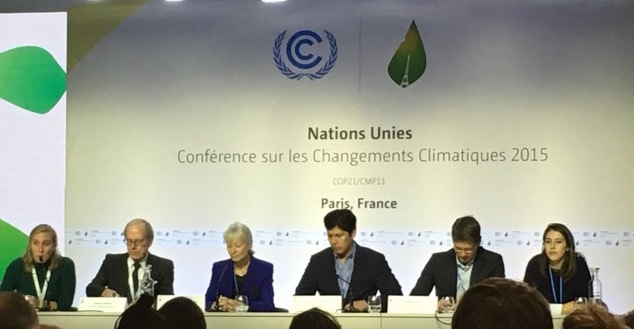 At a press conference on Wednesday at COP21 in Paris, representatives from the Rockefeller Brothers Fund, the California Senate, the World Resources Institute and the London School of Economics joined 350.org to announce that $3.4 trillion in assets are now committed to some form of divestment from fossil fuels. May Boeve, executive director of 350.org, noted that some of that divestment is partial, divesting only from coal, oil, natural gas or some mix of the three, while other commitments are total divestment from all fossil fuels. With varying degrees of disclosure, the actual amount of money divested is difficult to track, but organizations pledging either partial or total divestment represent $3.4 trillion in assets under management. Steven Heinz, president of the Rockefeller Brothers Fund, commented on the extraordinary acceleration of the movement in the 14 months since the fund announced its divestment plans in September of 2014, from $50 billion to $3.4 trillion. Heinz attributes the expansion of divestment not only to its “moral imperative,” but also to the “economic rationality” of risk management — pointing to the growing number of pension funds, banks and other financial institutions increasingly divesting their portfolios away from fossil fuels. Kevin De Leon, the president of the California senate, said that, as the seventh largest global economy, California’s move from fossil energy investment and generation proves that decoupling works, citing the state’s economic growth and shrinking emissions. DeLeon sponsored Senate Bill 185, targeting $500 million for divestment in the state’s pension fund. The legislation follows on the 2007 mandate from the California Energy Commission barring municipal utilities from operating any coal-fired power plants. Pascal Canfin, former Development Minister of France and senior advisor for international climate affairs at the World Resources Institute, said the growing momentum in fossil fuel divestment rests on three pillars: ethics, financial pragmatism and regulatory framework reform. 19 French cities have endorsed divestment ahead of COP21: 350.org will announce for the first time that it has secured commitments from 19 French cities, including Lille, Bordeaux, Dijon, Saint-Denis, Rannes, Ile-de-France and others. The French parliament has endorsed divestment: On Nov. 25, the French National Assembly adopted a resolution encouraging public investors, companies (especially those in which the state owns shares) and local authorities not to invest in fossil fuels anymore. The resolution is the first step to formalizing the policy as law. The French Ensemble Foundation will join European Divest-Invest: Jacqueline Délia Brémond, co-founder and co-chair of the French Ensemble Foundation, will announce that the foundation will join the European Divest-Invest initiative and divest its holdings from fossil fuels. Since 2004, the foundation has given over $28 million to environmental causes around the world. Uppsala became the largest city in Sweden to endorse fossil fuel divestment. Münster became the first city in Germany to divest completely from fossil fuels. Melbourne, the capitol of Australia, committed to go fossil-free ahead of COP21. In fact, Australia has seen a seven-fold growth in the divestment movement, from two councils divesting in 2014, to 14 divesting as of now. Together, these funds represent AUD$5.5 billion in assets under management. Oslo, the capitol of Norway, announced that it will divest its $9 billion pension fund (€8 billion) from coal, oil and gas companies, becoming the first capitol city in the world to ban investments in fossil fuels. The London School of Economics, one of the preeminent economics schools in the world, dropped all of its direct and indirect holdings of coal and tar sands, and all direct holdings of fossil fuel companies. APRA AMCOS, the biggest music industry organisation in the southern hemisphere, announced that it is beginning the process of divesting from all fossil fuels. APRA AMCOS distributed over $250 million in royalties to its 87,000 songwriter and composer members last year, making it a large cultural force for divestment. The London Science Museum announced plans to dump Shell Oil as a sponsor, amidst controversy and public pressure. In addition to the London School of Economics, five universities from the U.K. took action: Oxford Brookes University, University of the Arts London, University of Surrey and University of Sheffield divested from all fossil fuel companies; Wolfson College (Oxford University) divested from coal and tar sands. Fund manager CCLA, which manages investments for Birmingham City University, Cranfiled University, Heriot-Watt University, University of Hertfordshire, University of Portsmouth and University of Westminster excluded coal and tar sands from its investments. The first church in Germany, the Protestant Church in Hesse and Nassau, managing €1.8 billion, committed to drop investments in coal, oil and gas, too. Two weeks ago, renowned economists Thomas Piketty and Tim Jackson wrote a letterin the Guardian, calling on investors to divest from fossil fuel ahead of COP21.